Clapton Hart does ‘hip open fire pub’ to a tee. It is a vast space that actually needs its fires burning brightly. Visit for a strong craft IPA, a basket of white bait and that welcome feeling of boiling hot cheeks that comes with being in the close vicinity of open flames. "One of the best new pubs in East London"
There aren’t many reasons to trek all the way out to Clapton but at the end of a road filled with rundown businesses you’ll find one of the most appealing pubs around. 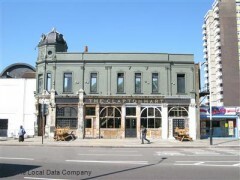 The Clapton Hart is a vast music hall of a pub. There are two huge dining rooms, high ceilings, slouchy seating all over the place and walls that appear to have been left to rot and ruin – in an attractively shabby chic kind of way, naturally. Serving food throughout the week, this is as much a place to come for a meal as it is to come for a drink surrounded by the interior’s charming dilapidation. Simple homemade dishes are knocked up from locally sourced produce. When we visit on a Sunday, we sample the roast dinner – a pile of pork and crackling, potatoes and fresh veg - and find that its reputation for quality and value is well deserved. As for what’s behind the bar, well, they’ve bought into the craft beer scene and stocked up on some excellent beers. A variety of Belgian beers are served from the bottle, micro brewed cask ales are on rotation and there are some powerful IPA’s on tap. The Neither Pale Ale was particularly delicious – although at £4 per half you’d expect that to be the case. Filled with the young demographic that seems to be rapidly spreading to Clapton for its more affordable housing, the atmosphere is much like that of any affluent London-village pub. Think The Spurstowe in Hackney or The Roebuck in Borough if you want a reference point. Perhaps best of all, The Clapton Hart also has a huge beer garden out the back. So besides the winter warmth of the interior, it has more than enough garden space to inspire the crowds come summer. Having had a lovely time on our first visit we decided to head here for NYE. Good call. The music was spot on, the staff were in the spirit and the whole night pretty much just emphasised what a great pub this is. It might not be that close but I think the 40 minute walk is negligible - this will be my new local! Great beers and white bait too.